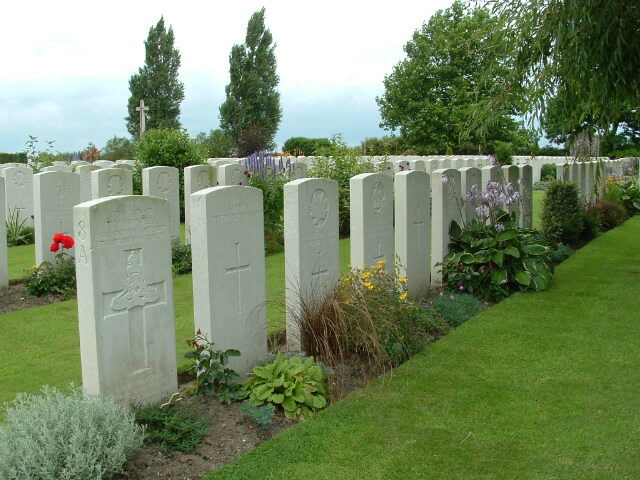 So, we started this mini-tour at La Belle Alliance Cemetery, with its 60 British burials; we then visited Divisional Collecting Post Cemetery & Extension, where just over 750 men are buried; now we arrive at New Irish Farm Cemetery, where 4716 men are buried or commemorated. 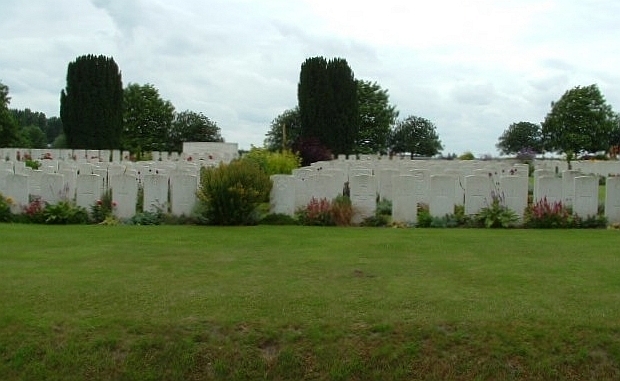 This place contains only a few hundred fewer graves than at Bedford House (a big place, as you will know, if you have accompanied Baldrick and myself on our tour of the cemeteries to the south of Zillebeke), yet concentrated in a much smaller area. Not much space here, but lots of flowers. 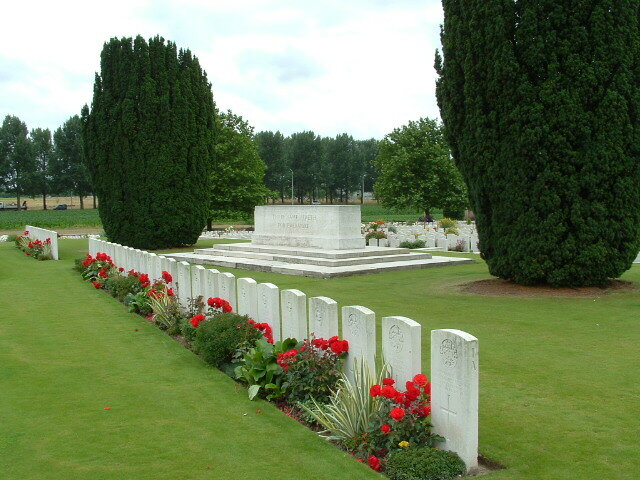 Cemetery entrance, the pathway beyond leading to the Stone of Remembrance in the background. 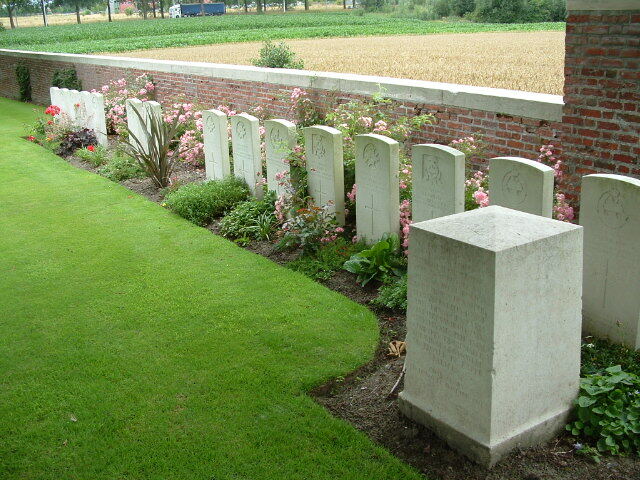 On a raised area near the centre of the cemetery, in front of the Stone of Remembrance, are the headstones of Plot I, which, at the time of the Armistice, contained the only burials here. 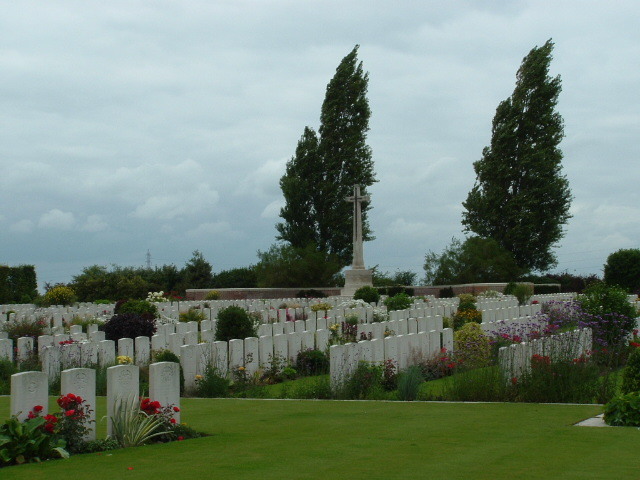 The cemetery had been used between August and November 1917 during the Third Battle of Ypres, and again in April and May 1918, but at the end of the war what later became Plot I consisted of just 73 burials. 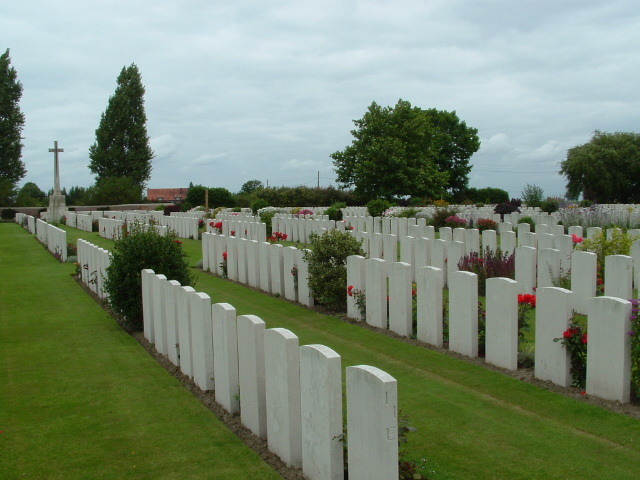 The headstones pictured here (part of Row A) are all of men killed in August 1917; the grave to the front left (Row B) is from May 1918. Still in Plot I, here we are looking south west, with Row C in the foreground, and Rows B & A behind. 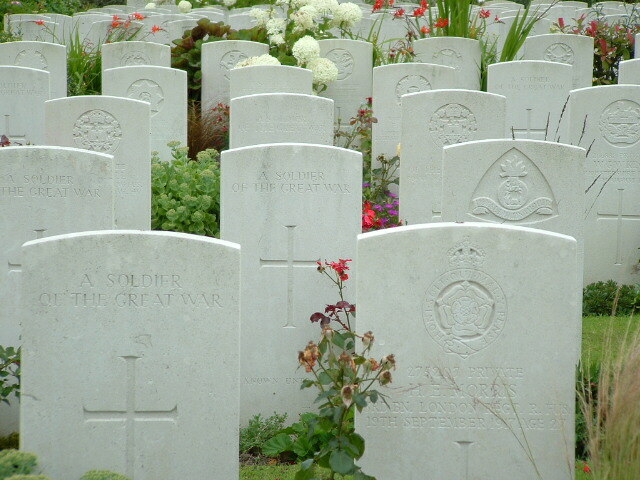 Thirty six of the graves in this plot are those of artillerymen, casualties of the August fighting during Third Ypres. View from the edge of Plot I looking west. 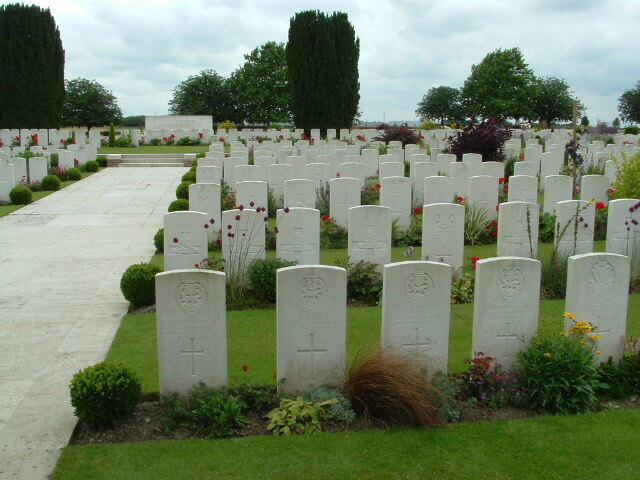 Mainly unidentified graves in Plot VI. 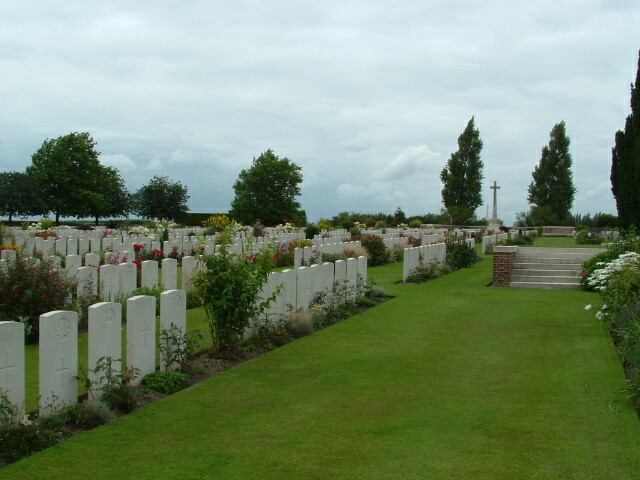 View looking north across Plot XIII (nearest camera) and Plot XII (the nearest headstones to the steps leading up to Plot I). 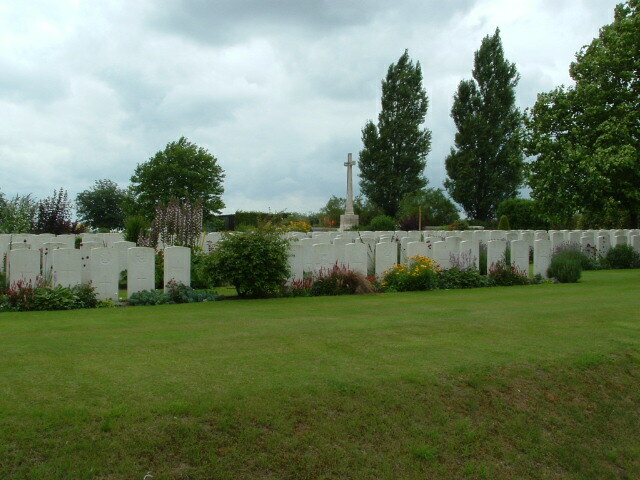 Duhallow Block and memorial headstones along the western wall of the Cemetery. 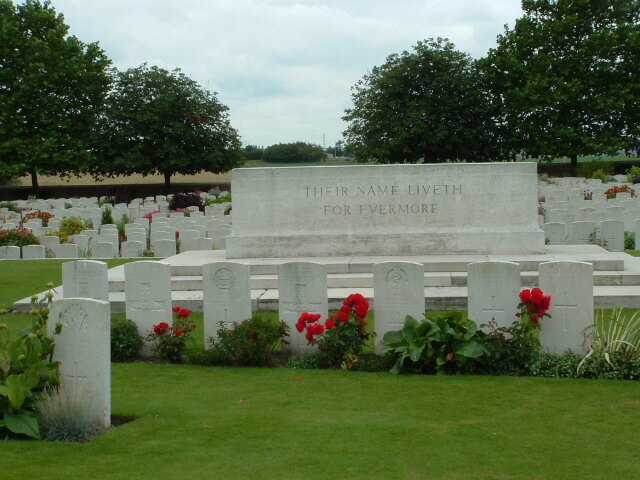 ‘To the memory of British soldiers originally buried in Lomme-La-Miterie German Cemetery, Francois Farm Cemetery, Vanheule Farm Cemetery & Spree Farm Cemetery, but whose graves were destroyed in later battles. 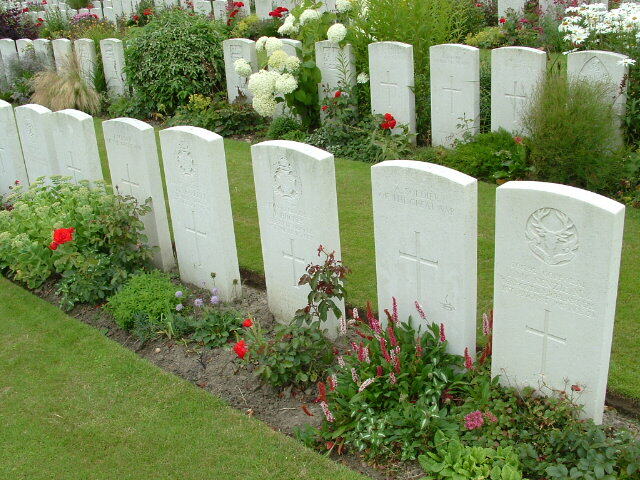 Their glory shall not be blotted out’. 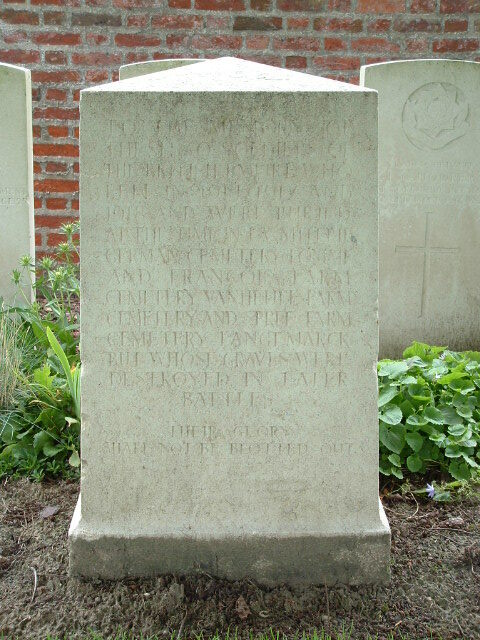 ‘Their glory shall not be blotted out’ was chosen as the inscription at the base of all Duhallow Blocks by Rudyard Kipling, and comes from the Book of Ecclesiasticus, as indeed does the better known line – ‘Their name liveth for evermore’ – that he chose to be inscribed on Lutyens’ Stone of Remembrance in the larger CWGC cemeteries. 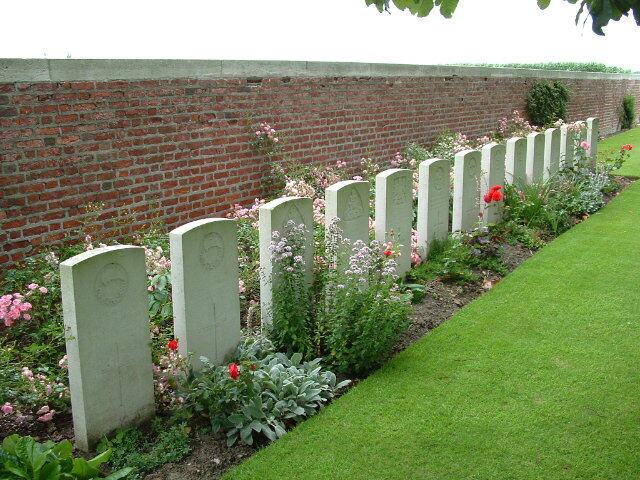 More memorial headstones to the right of the Duhallow Block. 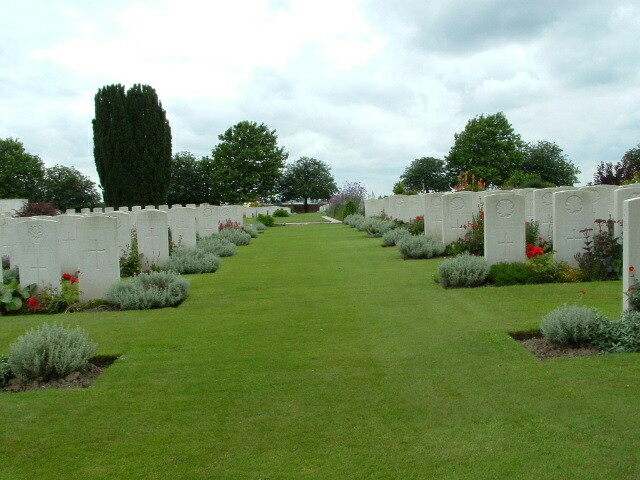 Looking north east from Plot XI. 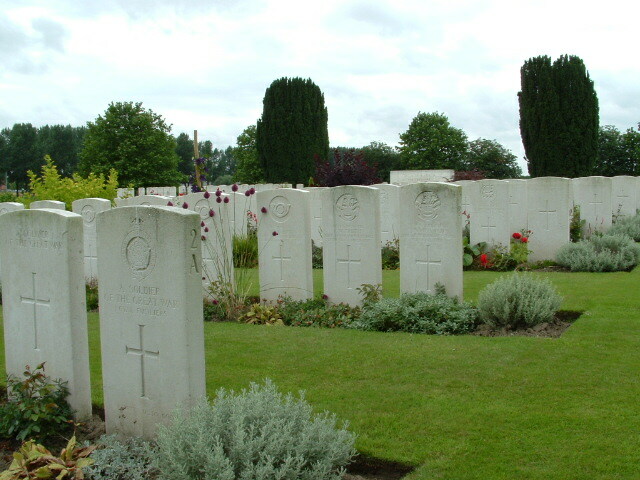 Ranks of headstones, Plot XII. 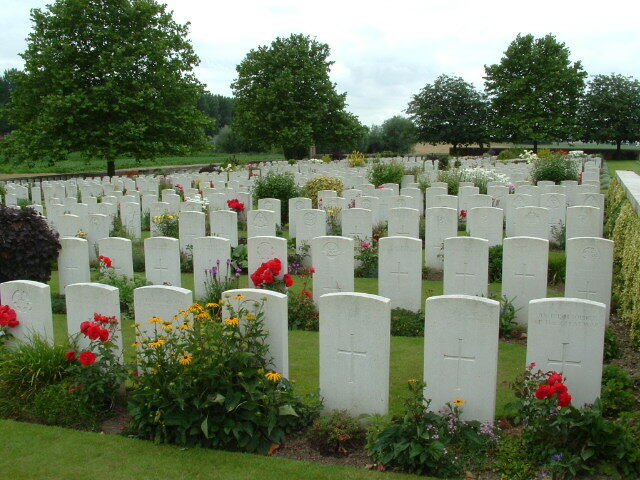 Still in Plot XII; so many regiments, so many unknown men. 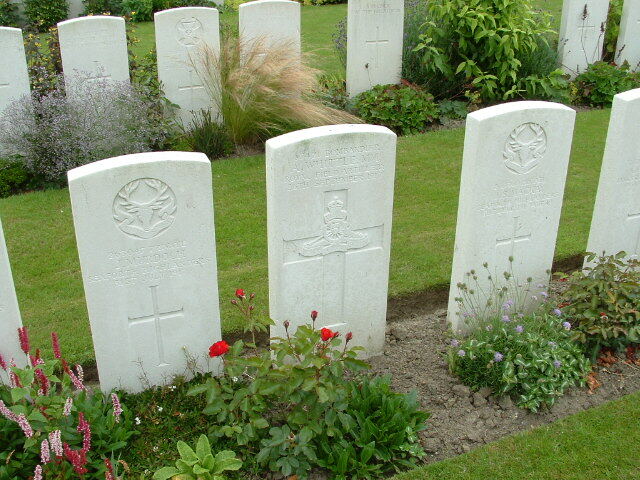 So typical of New Irish Farm Cemetery. 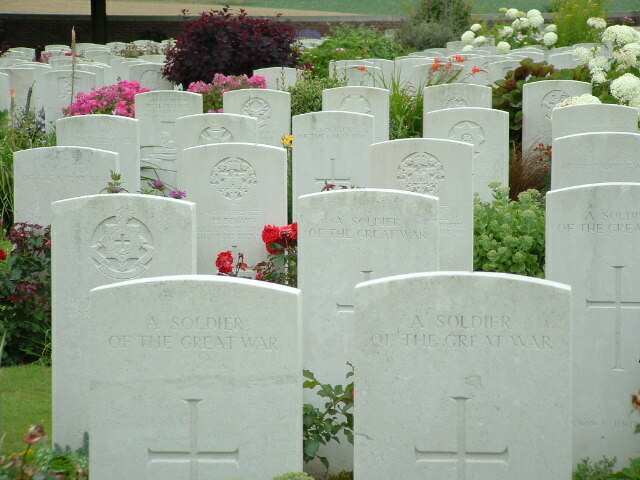 Back among the raised graves of Plot I, looking down the length of Row A. 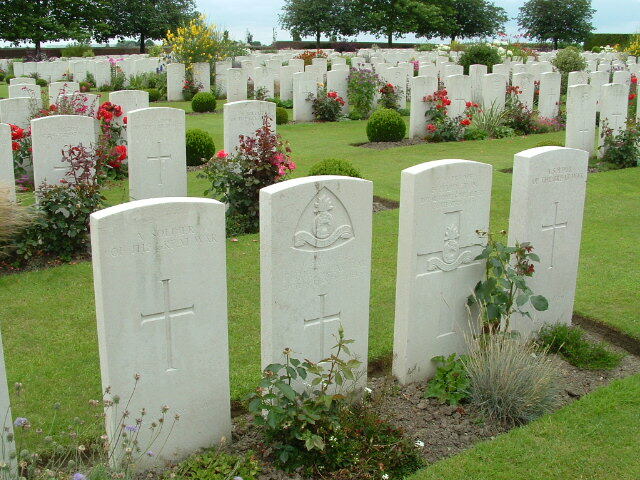 The first three graves are Royal Inniskilling Fusiliers, the next eight are all Royal Flying Corps graves, all 39th Balloon Section, all killed on the same day. November 17th 1917. I wonder what happened. 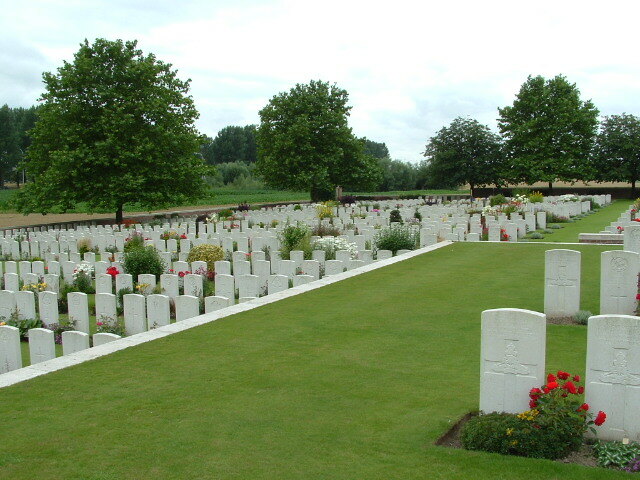 View looking west across the cemetery, with Plot II on the left and Plot VIII on the right. 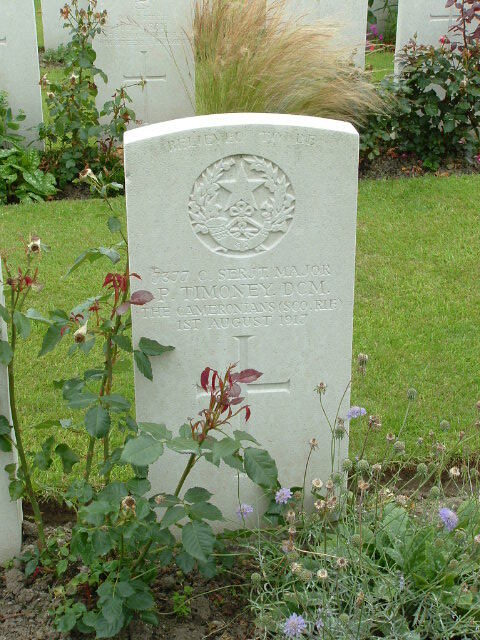 Turning slightly to our left, looking across Plot II (the headstone nearest the camera is that of an unknown Royal Fusilier) towards the Stone of Remembrance. 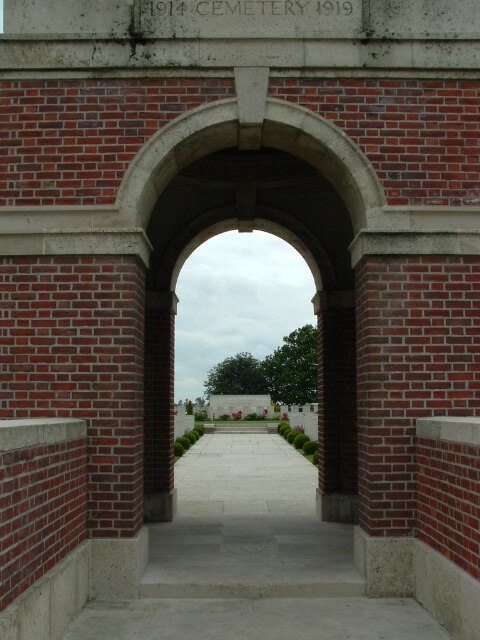 View from just inside the cemetery entrance, showing Plot II in the foreground, Plot III just visible to the left, and Plot I and the Stone of Remembrance beyond. 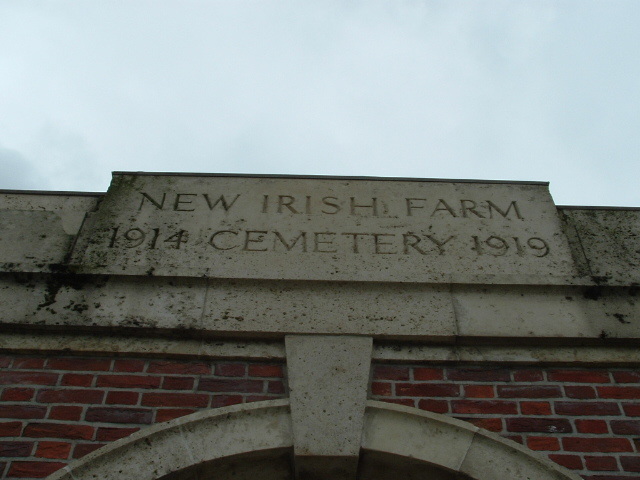 You won’t be surprised to hear that the cemetery was named after a nearby farm, nor that there was an earlier cemetery, entitled Irish Farm Cemetery and no longer in existence, a few hundred yards to the south. Thought not. Final view from the road as we take our leave. 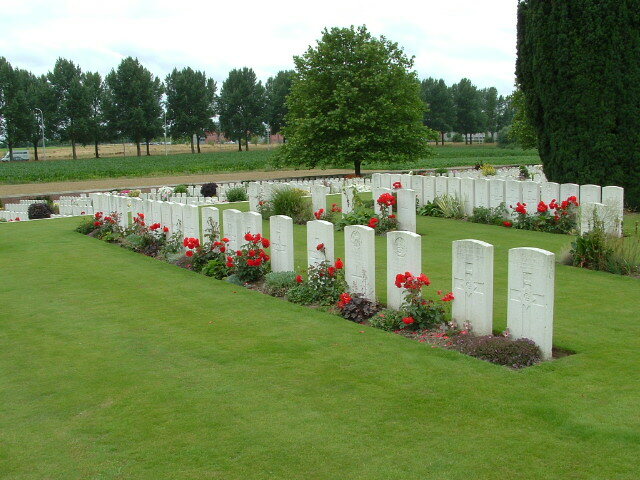 If you’re following the Road to Passchendaele posts, here’s Part Five.